The Rockford Inn lies hidden in the remote Brendon Valley on Exmoor, one of the two great National Parks in the South West corner of England. With just 7 rooms the 17th century Inn is one of the cosiest B&B hotels in North Devon and a perfect retreat from the stresses of modern life. With our focus on service and good food The Rockford Inn has become an extremely popular destination for short breaks in Devon. The Rockford Inn a traditional Exmoor B&B country Inn near the border with Somerset and is popular with local farmers, ramblers and fishermen alike. We provide quality bed and breakfast accommodation at affordable prices and is a great place to stay for those wishing to explore the vast open expanses of Exmoor. 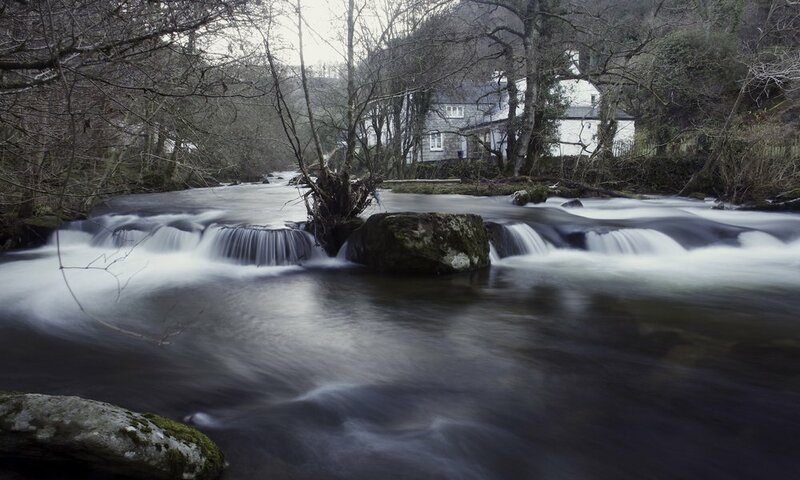 The dramatic East Lyn River flows by the property as it carves its way through the wild moors of Exmoor down to the sea at Lynton and Lynmouth. The fast flowing river is a walker's paradise with waterfalls, rocky rapids, house-size boulders and deep green fern-lined pools. The National Trust Footpaths are well maintained as they parallel the water's edge, through gorges and wooded valleys. We provide tasty home cooked meals using seasonal foods, local brewed real ales and feature open log fires and wood burning stoves. We also offer comfortable accommodation in which to stay, where we offer Bed and Breakfast, with full or half board an option. The East Lyn River is famed as one of the UK's best salmon and trout fishing rivers, with permits to fish available at the bar. During the colder months salmon can be seen leaping the waterfalls or laying in the deep pools. Of course this Devon bed and breakfast is popular with anglers. If you are lucky they can be seen spawning in pebbly shallows. The gin clear water in the deep pools, although cold, attracts those who like outdoor natural swimming. Rockford is just 3 miles up river from the quaint seaside towns of Lynton & Lynmouth. We provide comfortable and stylish rooms on a bed and breakfast basis surrounded by some of the UK's most beautiful landscapes. There are amazing country walks right on our doorstep. Whether it's up on the exposed, treeless moors, or along the South West Coast Path as it traverses some of England's highest sea cliffs. There are also many beaches nearby ideal for families with small children and equally appealing for surfers who flock here for the waves.